The V.I. 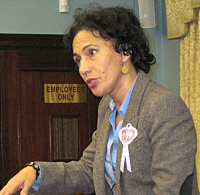 Water and Power Authority has rejected a request from Sen. Nereida "Nellie" Rivera-O’Reilly to waive one month of electrical bills for Christiansted businesses. WAPA said doing so would put bonds at risk of default and unfairly shift the costs to other ratepayers. On Jan. 18, O’Reilly wrote a letter to the WAPA asking it to give businesses in Christiansted a month of free electricity. In the letter, O’Reilly argued that the businesses have seen reduced activity because roads were blocked off at times for WAPA crews doing trenching work to place power lines underground. "Our office continues to receive calls and emails from downtown Christiansted business owners whose operation is negatively impacted by the ongoing construction," O’Reilly said. "We understand … that postponement of the construction is impossible because further delays would result in the loss of FEMA funds," she said, adding that she appreciates WAPA’s zeal to complete the work quickly. But if businesses close as a result of the loss of business, WAPA will lose ratepayers and revenue too, she said. "Clearly you too have heard from business owners who maintain that the ongoing construction has resulted in lower cash receipts even during the holiday season. Equally disturbing is the fact that this is the period in which St. Croix enjoys visitors arriving both by plane and cruise ships," O’Reilly continued. As an example, she cited an unnamed business owner who "reported making a paltry $100 in sales yesterday" (Jan. 17). "His electrical bill is $2,000 per month. Imagine trying to stay in business under these conditions," she said. "While I understand the significance of this project, I urge you to consider the impact the project has had on businesses and explore ways to support them. I firmly believe that waiving one month of electricity in exchange for the inconvenience and loss of income is a reasonable tradeoff," she concluded. 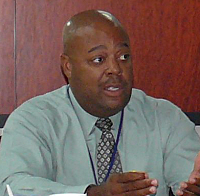 WAPA Executive Director Hugo Hodge Jr. denied the request in a letter Wednesday, saying it would force WAPA to shift the cost to other ratepayers, which it cannot do without the approval of the V.I. Public Services Commission. And doing so would take revenue away that is legally pledged as security for bonds, putting WAPA at risk of default, he said. "Unfortunately, the Authority is not in a position to consider this request," Hodge said in a letter to O’Reilly. Bonds are "the primary source of funding for the majority of the Authority’s capital projects," he said. "When the Authority issues bonds, it pledges as the source of repayment for the bonds the revenues it derives from its water and electric services. As a result, the bond indentures prohibit the Authority from providing ‘free service.’"
Hodge said he appreciates the difficulty that road work creates for Christiansted businesses. "Regrettably, there is never a good time to perform a project such as this, particularly in the midst of a business district," he wrote. Next articleOne Year Post-Hovensa: Worse Before It Gets Better? Nice try Nellie but Hodge aint givin up his grocery money. If the Senate reduces their salaries back to the pre bill 6901 and Hodges salary, as well, they can pay for “free service” for those businesses. Do we deserve to continue to be at the mercy of WAPA’s ever increasing LEAC? If Nelly wants to do something, then get it together with a competent “energy crisis” plan which will stop the downhill slide that WAPA and our government have continued to promote for decades due to their ineptitude.